“Because no woman should die giving life.” That’s the simple, dramatic tagline for Saving Mothers, a nonprofit organization dedicated to eradicating preventable maternal deaths in developing countries. Founded and run by medical professionals, Saving Mothers recognizes that the vast majority of these deaths occur due to lack of access to quality healthcare and or even basic sanitary medical supplies. Shocked and saddened by the scope of this problem—more than 343,000 die during childbirth every year—founders Dr. Taraneh Shirazian and Dr. Nichole Young-Lin resolved to mobilize whatever resources they could to effect change in this area. One of their simplest and most effective interventions is the kit. At a cost of only $10, each kit contains everything that even the most minimally skilled birth attendants need to ensure safe deliveries outside of the hospital setting: soap to cleanse the birth mothers’ perineum, a shower curtain to provide a clean surface for delivery, rubber gloves, and a razor blade to cut the umbilical cord. 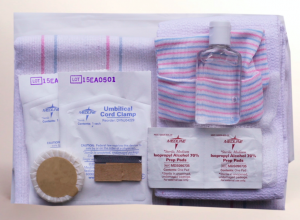 These ordinary items are essential to preventing the spread of infection during delivery. You can help save a new mother’s life for less than it would cost to treat you and your BFF to Starbucks. As you hold this book in your hands—and probably your baby in your arms—think back to when you packed your own “kit” to prepare for your hospital stay. Wouldn’t it be nice to provide a safe birth kit to a pregnant mother a world away and enable her to survive to see her baby grow up? To learn more, visit www.savingmothers.org/safe _ birth _ kits.